The Dining Hall at Oscarshall is in a separate annexe, connected to the main building by an open loggia. The walls of the Dining Hall are decorated with paintings by Joachim Frich and Adolph Tidemand. The almost completely detached setting of the Dining Hall makes it unique in relation to the other rooms and the fact that guests must go outside to pass from the Drawing Room to the Dining Hall emphasises the summery, recreational aspect of the Palace complex. The Dining Hall features four multi-coloured lead glass windows, arranged in pairs and surrounded by a flattened Tudor arch. The windows in the end walls are the same as those in the Drawing Room and have red, orange, ochre and green glass in the upper section. Mirrors are set into all the walls to make the room appear even larger than it is. 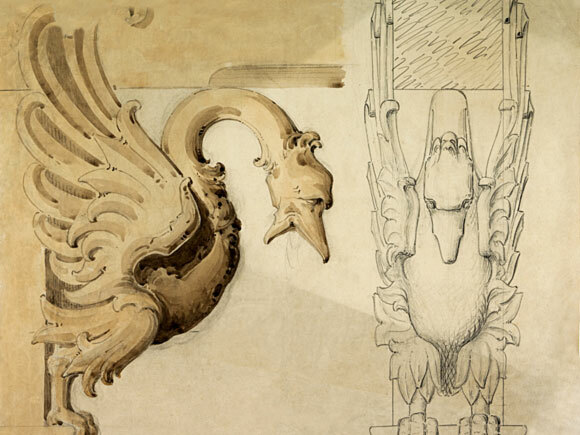 The walls are covered with carved panelling and moulded oak pilasters with consoles in the shape of swans at the top. The swan consoles support the beams that run across the ceiling. Between the beams the ceiling is decorated with simple Neo-Gothic ornaments in red, blue and gold on a white background. The ornamentation of the Dining Hall bears elements of both the Norwegian and the continental Middle Ages. It is well-known that the architect Johan Henrik Nebelong collaborated with the painters Joachim Frich and Adolph Tidemann on the decoration of the Dining Hall at Oscarshall. He designed the room in such a way that the paintings stood out, but at the same time appeared as part of the overall architectural design. Joachim Frichs six landscape paintings, in oil on canvas, have been described as a high point in his productive career. The paintings can be said to portray the quintessential features of Norways natural landscape, particularly as it appeared to foreigners and Norwegians living abroad. It was King Oscar Is wish that the Dining Hall should be painted with views of Norway, encased in decorated woodwork, like the antechamber to the Throne Room in the Royal Palace, the Bird Room. Laugen i Numedal (Laugen in Numedal). Adolph Tidemands ten paintings depict the life of a Norwegian farmer family from cradle to grave. The motifs were typical for the period and in line with the national romantic idea of the emancipated farmer as the embodiment of essential Norwegian values. The series consists of eight circular and two rectangular paintings set in the frieze along the top of the two long walls above Frichs landscape paintings. The series starts on the left of the long wall by the sideboard. The first picture is called Gutten og piken på seteren (Boy and girl in the pasture). This is followed by Frieriet (The Proposal), Brudefølget (The Bridal Procession), Familielykke (Family Happiness) and Ved det syke barns leie (At the sick childs bedside). On the opposite wall from the left are Moren leser for barna (The mother reading to her children), Faren lærer sønnen å knytte garn (The father teaching his son to tie a fishing net), Lystring (Spearfishing), Den yngste sønnens avskjed (The youngest sons farewell) and finally the most well-known in the series De ensomme gamle (The aged alone). Frichs six landscapes were given a somewhat mixed reception at the time. And there were negative voices to be heard amongst the critics when Tidemands paintings were exhibited together with Frichs landscapes at the Christiania Kunstforening. The depiction of the farm folk in their Sunday best was considered to lack realism. However, it has been pointed out that the paintings were designed to fit in with their surroundings, in a dining hall in a summer palace, and that an idealised representation was therefore appropriate.